Mailae Halstead is a student therapist and clinical assistant at the Behavioral Wellness Clinic. 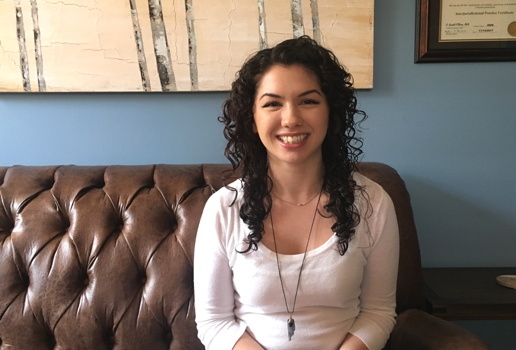 She is currently completing her Master's Degree in Clinical Mental Health Counseling at Southern Connecticut State University through their CACREP-approved counseling program. Mailae is also completing a clinical internship at Bridges Healthcare, a community non-profit clinic in Milford, Connecticut where she provides individual and group therapy in their adult outpatient facility. Mailae graduated from University of New Orleans, obtaining her Bachelor’s of Science in Psychology. During this time, she volunteered as a research assistant in the Developmental Cognitive and Affective Psychophysiological Lab (DCAP), which used electroencephalograms (EEG) to study a variety of conditions, such as binge eating behavior, cognitive control in children, and the impact of violence in video games. Mailae believes in nurturing each individual's capacity for insight through teaching skills to assist them in achieving a state of emotional wellness. She prides herself in using evidenced-based treatment techniques while maintaining a person-centered approach that strengthens the therapeutic relationship with her clients. Trained in Functional Analytic Psychotherapy and Family Systems therapy, Mailae is passionate about trauma-informed care for PTSD. Her approach includes an awareness and appreciation of multicultural issues including race and ethnicity, disability, women's issues, affectional and gender orientation, among others. Mailae treats obsessive-compulsive disorder (OCD) using the specialized cognitive behavior therapy, Exposure and Ritual/Response Prevention (ERP). She oftentimes works along side other specialists in assisting with exposures and treatment as she completes her training. She has also received training in ketamine-assisted psychotherapy, as an alternate treatment method for those suffering from depression, PTSD, and anxiety. Mailae was born in Houma, Louisiana and is a member of the United Houma Nation — a small Native American tribe indigenous to the southern Louisiana swamplands. Although she deeply embraces her creole-native heritage, her namesake is derived from her father's Japanese-Hawaiian background. Mailae’s name originates from the wildflowers often used to make Hawaiian leis, which symbolize peace, friendship, and love.